Man of the match Gleason Fournier on the stretch against Fife Flyers. Pic: Jillian McFarlane. 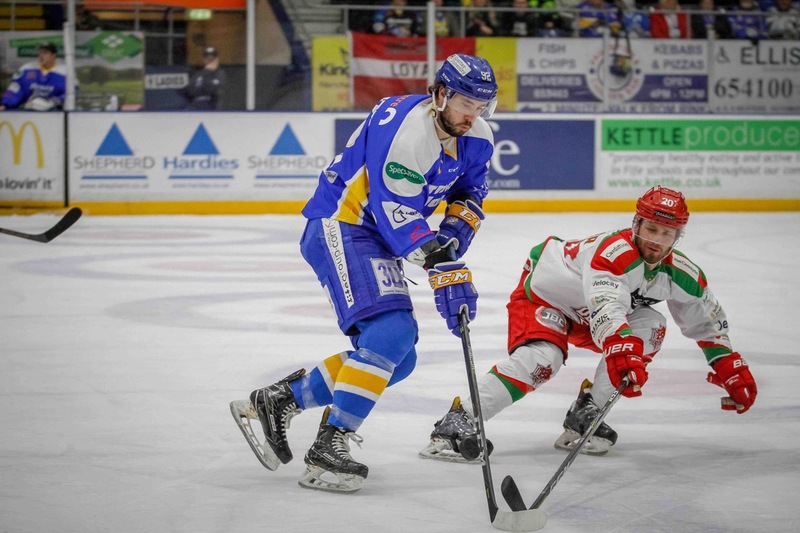 Cardiff Devils hit back with a vengeance at the Fife Flyers Arena in Scotland. The Welsh team were 2-0 down midway through the Elite League match before scoring seven successive goals and powering to an eight-goal victory. Man of the match Gleason Fournier played a key role, while Mike Hedden scored two goals. “It was a great win in a quality hockey match,” said Devils coach Andrew Lord. “The first two periods were hard fought and close. “We dug in and I really liked last 10 minutes of the second period. We talked about keeping our foot on the gas and did that. After a goalless first period, Flyers took control thanks to Marcus Besara (20-29) and Carlo Finucci, who netted off a face-off (29-02). When the game moved past the halfway mark Devils showed the character, spirit and quality they have in their team. Gleason Fournier scored unassisted with a backhand shot that fooled goalie Shane Owen (30-28) and Justin Faryna tied the game (33-09). Face-Off in Fife. Pic: Jillian McFarlane. Just 30 seconds later Devils were ahead for the first time when Hedden scored with a wraparound goal. Joey Martin tipped in a shot from Fournier (37-20) before Hedden (44-27), Joey Haddad (44-55) and Sam Duggan (48-35) swept Devils into an 7-2 lead. Former Devils forward Paul Crowder pulled one back after 54-15 before Layne Ulmer restored the five-goal advantage for the Devils when he made it 8-3. Ben Bowns made 23 saves for the win and the Devils powerplay went 1/2. Captain Jake Morissette and his team now play Dundee Stars at the Viola Arena on Sunday (6pm). Scorers, Flyers: Marcus Besara 1+1, Carlo Finucci 1+2, Paul Crowder 1+1, Rick Pinkston 0+1, Scott Arssen 0+1. Devils: Mike Hedden 2+0, Gleason Fournier 1+2, Sam Duggan 1+1, Justin Faryna 1+0, Joey Haddad 1+1, Joey Martin 1+0, Layne Ulmer 1+1, Bryce Reddick 0+1, Matthew Myers 0+1, Charles Linglet 0+3, Evan Mosey 0+1, Craig Moore 0+1, Sam Duggan 0+1. Period scores (Flyers first): 0-0; 2-4 (2-4); 1-4 (3-8). Penalties in minutes: Flyers 0+4+2=6; Devils 2+2+2=6. Shots on goal: Flyers (on Bowns) 6+10+10=26; Devils (on Owen) 7+9+13=29. Special teams: Flyers PK 1/2, PP 0/2; Devils PK 2/2, PP 1/2. Referees: Blake Copeland and Chris Wells. Stars of the game: Flyers, Marcus Besara; Devils, Gleason Fournier. Mike Hedden scored twice for Devils. Pic: Jillian McFarlane. Other Saturday results: Guildford Flames 3, Nottingham Panthers 8; Dundee Stars 4, Coventry Blaze 2; Milton Keynes Lightning 5, Manchester Storm 2; Sheffield Steelers 2, Belfast Giants 4. TICKETS – You can still get tickets for Sunday’s home game against Dundee ONLINE HERE or by calling 0800 0842 666 or in person at the reception desk at VIOLA ARENA right up until face-off at 6pm.